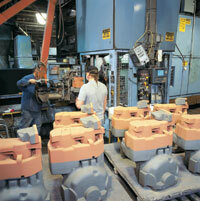 The Wisconsin Cast Metals Association traces its origins to the mid-1960's. Know as the Metropolitan Milwaukee Foundrymen, this association was one of the first organized efforts by Wisconsin foundries to begin dealing with environmental issues. Formed initially to provide industry input on an air pollution control ordinance being proposed by Milwaukee County, the organization's focus shortly thereafter shifted to the state level. It was clear that a Madison presence was going to be necessary to have any influence on legislative and regulatory policy. To reflect these expanded activities, the name of the organization was changed to the United Foundrymen of Wisconsin and more recently to the Wisconsin Cast Metals Association. In 1985, spearheading a successful legislative effort to allow high-volume industrial by-products to be beneficially reused outside of landfills for the first time. Funding pioneering research by the University of Wisconsin, undertaken jointly with the Wisconsin Department of Natural Resources and the Department of Transportation, which demonstrated no detrimental effect of groundwater from store foundry sand as compared to native soils. Obtaining a grant from the Recycling Market Development Board to survey Wisconsin Foundries on their disposal practices and ascertain how much disposed material is being produced and what is happening to it. A geographic information system (GIS) mapping project and county-by-county data was produced from this research to aid potential users. Putting the concept of "cooperative regulation" to work, WCMA representatives, with the Department of Natural Resources, have jointly developed regulations covering VOC-emitting core washes in the non-attainment area, a streamlined, "self-implementing" permit system for beneficial reuses (NR 538), and compliance strategy for benzene emissions under NR445. Assembling a national database on successful reuse applications, including a website that can be accessed and updated, with the assistance of grants from the Recycling Market Development Board and the American Foundry Society. WCMA was a founding partner of FIRST (Foundry Industry Recycling Starts Today), a national marketing effort focusing on promoting the reuse of foundry by-products. These activities are just a few examples of why the WCMA has come to be recognized by regulators, elected officials, and the business community as a responsible voice for the metalcasting industry in Wisconsin. All of these activities are consistent with the WCMA's policy of being proactive , rather than reactive, on legislative and regulatory issue affecting the foundry industry. It is the philosophy of commitment and involvement that has served our members well and which guides us in the challenges ahead. Copyright © 2013 Wisconsin Cast Metals Association. All Rights Reserved.